Register for a first order discount to buy this for just £626.40, saving £69.60. 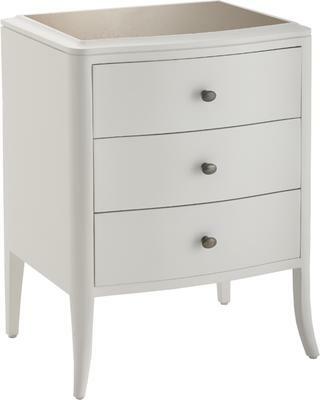 For a functional and durable piece of bedside drawer, the Maxton 3 Drawer Bedside is a great pick. Featuring clean lines and ample storage space, the bedside includes a smooth top surface you can use for displaying your alarm clock or bedside lamp. Running down the centre are three spacious drawers. Each one is fitted with an antique brass button handle for easy access. The entire bedside is made out from mahogany wood so it's guaranteed to be sturdy. At the bottom are four thin but supportive legs. They beautifully balance out the squarish body of the bedside and give it a chic, stylish touch. R V Astley was established in 1971 and originally specialised in antique reproductions, but they steadily grew, and moved to encompass the complete interior experience, adding furniture, then mirrors and chandeliers. As RV Astley's ranges developed, so did their involvement in design, styling and manufacturing relationships, which enabled them to achieve their own style and quality and create their own unique direction, one that is driven by design, to provide you with exclusive, high quality lighting, furnishings and accessories.